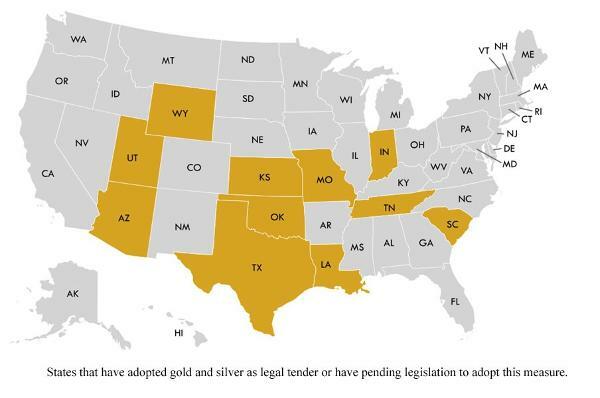 On Monday, May 22, Arizona joined a growing number of states that will recognize gold as “legal tender.” Why have these states decided to follow this extraordinary path and how significant is this to our current financial structure? The answers to these questions remain largely ignored but are extremely important and relevant to each of us. The bill signed into Arizona law by Governor Doug Ducey this week will make gold and silver “legal tender” starting Aug. 9, as many states return to our constitutional roots. The United States Constitution states in Article I, Section 10, “No state shall…make anything but gold and silver coin a tender in payment of debts.” However, this simple statement has been ignored for many decades by virtually every state. In their passivity, states empowered the Federal Reserve to dominate both the creation and the management our national currency on behalf of the federal government. But now things are changing. By introducing legislation that re-establishes their constitutional prerogative, states like Arizona are effectively endorsing a competing currency to the dollar. By making this choice for “sound money” the states are saying, in effect, that the Fed has done a poor job of managing the currency and they are attempting to protect the wealth and savings of the citizens within their borders by providing them with an alternative to the endless supply of dollars being conjured up by the central bank. The movement to provide a sound money alternative has been led by states such as Utah and Texas. Both of these states have not only accepted gold and silver as legal tender but have gone so far as to create bullion depositories to secure both the private and public precious metals within their respective borders. In this way they are assured the Fed will not be able to confiscate their wealth in times of economic stress or dollar tension. The actual laws being passed by these states are very simple. They recognize gold and silver as currency and therefore it is free from taxation. So when a citizen buys precious metals and over time they appreciate in value against the dollar, it is not viewed as a capital gain and is therefore not taxed. Investment gains are always taxed in one way or another, but gold and silver are “money” and imposing a tax on the exchanging of one form of money for another is unjust and unwise. The inflation tax on every person holding “fiat money” whittles away at his or her savings and the future purchasing power of their assets. While the dollar (The Federal Reserve Note) has lost more than 97% of its purchasing power since the Federal Reserve System was created in 1913, gold and silver have acted as a much better store of value, rising 60 and 20-fold, respectively, in their dollar-denominated price. With an ever increasing number of states choosing to accept gold as legal tender they are signaling that the financial structure of the current system may be weakening and are preparing an alternative for their citizens if that structure falters or fails. Arizona has chosen to follow the path of sound money and encourage the use of gold and silver as currency. This is money — real money — unencumbered by third parties or debt burdens assumed by others that cannot be repaid without monetary debasement or some other currency manipulation. Seven states have passed laws that recognize gold and silver as legal tender. Many others are actively considering similar initiatives. Globally, central banks from Russia to China, Turkey to Iran, Western Europe, the European Central Bank and here in the U.S. all hold large amounts of gold as a key reserve asset within their portfolios. We should all listen closely and attentively as gold is restored to a place of prominence in the world of currencies. And we should all begin to save a portion of our wealth in a currency that is not some other parties’ debt obligation.